Do you think all lives matter? I’m going to take a hopeful stab in the dark and say yes. I would hope that most people do. So much so that it should go without saying. Every life is important. And not because they are someone else’s partner, parent or relative; people matter in their own right, not just for who they are in relation to someone else. But the #AllLivesMatter “movement” that keeps popping up is not actually about that, since it never existed before the #BlackLivesMatter movement. So is it really about “equality”, or is it more of a derailing tactic? Just take a look at those three words really carefully. Not “Black lives matter the most”. Not “Black lives matter more than (insert colour/creed here)”. Not “Only black lives matter”. We are literally living in a world where black lives are valued less than other lives. The news out of America is a constant and distressing stream; police have killed 136 black people in 2016 alone. 258 were killed by police in 2015. People of colour in the U.S are far more likely to be imprisoned than white people and are sentenced far more harshly. Victim-blaming, gas-lighting and other tactics designed to deny there is a problem are rife. If you deny the problem, you don’t have to act on it, right? Even easier if it doesn’t directly impact you. Black Lives Matter Here, Too. We have similar issues here. Aboriginal Australians make up about 3% of the Australian population yet they make up 24% of the prison population. This is not because Aboriginal people are somehow more likely to be criminals. There are a number of factors like mandatory sentencing for minor crimes, poverty, prejudice in the justice system and other inequalities faced by Indigenous people. Deaths in custody, the flow-on effect on communities from the high rates of imprisonment- these are issues here in Australia that it is difficult to avoid comparing to the situation in the US. We know that Indigenous people in Australia have a shorter life expectancy, higher rates of infant mortality, higher rates of poor health and lower levels of education and employment than other Australians. African Americans also have a lower life expectancy, higher rates of infant mortality, poorer health outcomes, lower levels of education and employment. The disparity in education levels and employment levels alone mean people of colour are more likely to experience poverty. So does the higher number of people of colour in the prison systems. Poverty is a cycle and not one that is easily escaped, especially when your opportunities are already being limited. The parallels between Australia and America are impossible to ignore. It’s not just a coincidence that people of colour must struggle so much harder for what privileged, white people like me are free to take for granted. We can’t afford to ignore that systemic racism is a factor in all this. When people insist that “all lives matter” in response to those pointing out that Black Lives Matter, it becomes obvious that they choose not to acknowledge the significant inequalities that are already in play. Saying that “all lives matter” might make someone feel like they are being a champion for equality, but what they are actually doing is ignoring the fact that in many ways, it is being demonstrated that black lives don’t matter anywhere near as much as other lives. Equality is about giving everyone the same thing, assuming that they are all starting in the same place. People of colour are literally being born at a disadvantage, so cries for equality isn’t what’s appropriate here. Equity is. 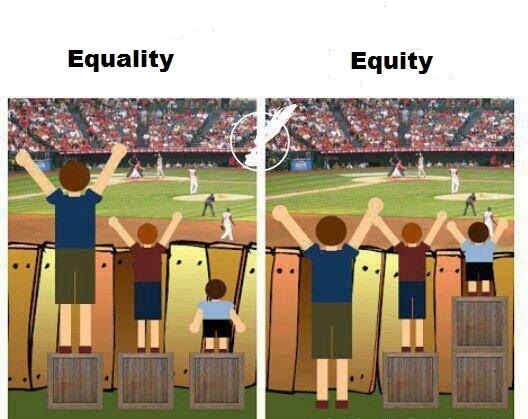 Equity is about leveling the playing field so that everyone has the ability to access same opportunities. Equality: Everyone has a box to stand on to see the game. Equity: Some people can see without a box, some only need one box and some will need more than one so that they can see as well as everyone else. Image via Imgur. When you really break it down, it’s simple. Imagine you are on a rescue mission. A ship full of people has sunk and there were a thousand people on board. You and your rescue crew are almost there. You learn that there were only 800 people were wearing life jackets when it went down. The order of rescue becomes obvious- those 200 without life jackets need to be picked up first, if possible. That doesn’t mean that you and your crews won’t rescue every single person possible, just that you are going to give first priority to those most at risk of drowning. All those lives matter. No one life is more important than the next. But logic and common sense dictate that those in the most danger should be helped first. Comic via ChainsawSuit.com See the extended, updated version here. We are all part of a system that oppresses and disadvantages people based on things like race, gender, sexual orientation and level of ability. To help dismantle these systems, we have to listen to those effected directly by them. I can’t, as a white woman, fully understand what it’s like to be a person of colour. It’s not my lived experience. As a white person, one of the best things for me to do is listen to and learn from people of colour.